Audiobook Runtime Approximately 6 min. 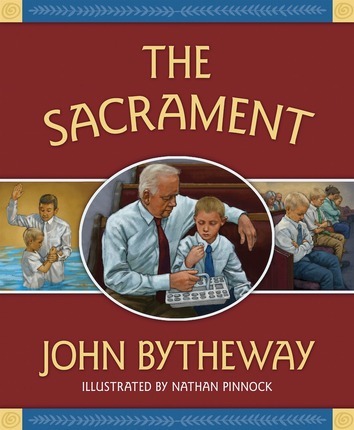 This is an excellent teaching tool for children on the sacred meaning of the sacrament. 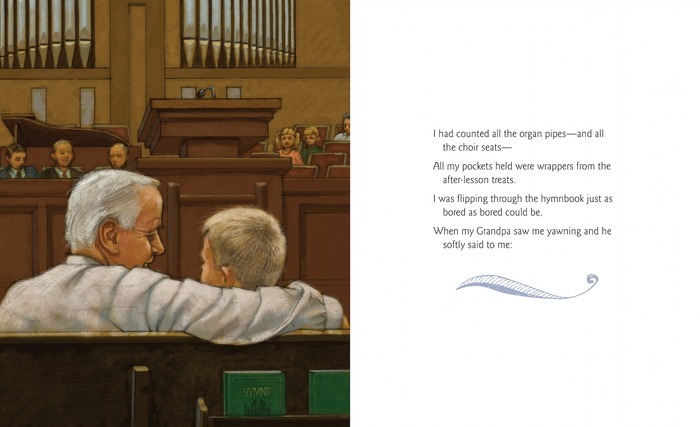 It's easy to get distracted during sacrament meeting, children and adults alike, as this book pointed out. Such wondering of thoughts makes one forget the reason for the ordinance. This book through verse did the trick for getting across the understanding of who the focus should be on. It reminds the reader that the reason for reverence is Jesus. I take my three children to church with me each Sunday and at times I get a heck of a time wrangling them to sit still during sacrament meeting particularly during the actual passing of the bread and water (thanks to those people from time-to-time over the years that extended their helping hands!). They're a bit older now (11, 7, 5) so they're pretty good about being quiet but I want them to truly grasp the reason for the reverence. This book powerfully did that. It did so my accounting a simple story of a young boy on vacation having the time of his life at his grandfather's homestead. It didn't occur to him that he would have to go to church even on vacation. So comes church day and bored as can be. Grandpa noticing his weariness whispered a story to him of an observation he had when he was about the same age. Grandpa had noticed many people then were distracted as well and lost focus that the hour was a time for worship. Grandpa recalled wondering, "Yes, I couldn't help but wonder what the Lord Himself would say should He walk into the chapel while His Saints behaved this way; Would His loving eyes be saddened; would His countenance be grim while He there observed and listened to a service meant for Him?" (p14). Wow, what a wake up call! Surely inspired the boy to remember Jesus from then on during sacrament ...and me too! ...and my kids! ...and those who read this book! This book is now on my list of outstanding books for gifting. I also foresee utilizing this for sharing time when a call for a lesson on sacrament arise. Absolutely fabulous picture book! *Hardcover provided by publicist in exchange for an honest review. Even as an adult I too often let my mind wander during sacrament. This book was a wonderful reminder of the divine purpose of sacrament and the power of the covenants we make and renew each week. Brother Pinnock's Beautiful illustrations, coupled with the wise words of Brother Bytheway, make this a delightful book to own. Perfect for a baptism gift, or any occasion. What a great product! great for a baptism gift! 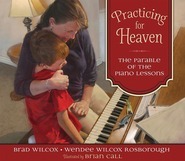 This is a wonderful story to help parents teach and reinforce the sacredness and importance of the Sacrament. Grandpa is an excellent person for teaching with patience and love. If you have or know someone preparing for baptism, this is an excellent book to prepare them. An AMAZING book about the ordinance of the Sacrament! Wonderfully told in poetry form! A young boy goes to visit his grandparents. While attending church with them he finds his mind and attention wandering especially during the Sacrament. Should He walk into the chapel while His Saints behaved this way." Through this the boy learns the sacredness of the sacrament and what things to think about... and not think about... during this special time of worship. PERFECT to help young children! a GREAT reminder for all ages! This is a poem about a young boy who goes to visit his grandpa. They have lots of fun and when Sunday comes, it's time to go to church. He's not very enthused about this and while he's sitting in Sacrament Meeting, obviously bored, his grandpa, whispering, tells him a story of when he was young and how he came to appreciate the sacrament. This leads the boy to reflect on the covenants he made when he was baptized and how he can improve his behavior during the sacrament. This is a great book for young and old! After reading it, I reflected on what I can do to make the sacrament more meaningful for me each Sunday. There's also two pages at the end titled "Symbols of the Sacrament." This is a great way to start a meaningful discussion on the symbolism we see every Sunday. I also enjoyed the pictures! Visiting grandpa looks like a lot of fun. I also got a kick out of the pictures of the bored or distracted congregation. Then, there are pictures of baptism, the sacrament and the Savior. This makes a great Family Home Evening lesson and is a book I highly recommend to everyone! This book is adorable and it tells about the Sacrament in a kid-friendly way. One of the best features of the book is the last 2 pages where John Bytheway points out all the symbols you see in the chapel during the sacrament and discusses how we can use each of the symbols to help us remember the Savior and understand the atonement. This book would make an excellent baptism gift! 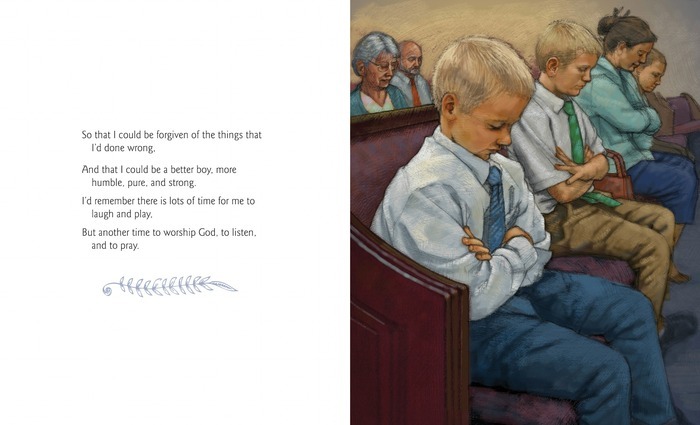 A beautiful book that nicely illustrates the importance of taking the sacrament. This ordinance is an important part of worship in The Church of Jesus Christ of Latter-day Saints (Mormons). The story reminds the reader that while it is easy to get distracted in church, it's important to pay attention to the reasons for being there. The story revolves around a young boy who goes to church with his grandpa while on vacation and who struggles to stay awake and focused. Then his grandpa gently teaches him about the reasons for the ordinance and why we need to direct our attention away from worldly cares and focus on Jesus Christ. The author also takes the time to simply explain the symbolism inherent in the ordinance. A great book for teaching children about a vitally important ordinance. Very cute and a great teaching tool! 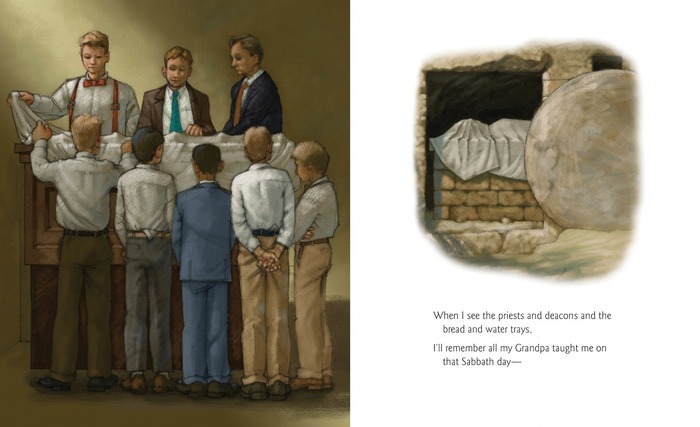 The Sacrament is a great book to teach your children about the meaning of partaking of the sacrament. I'm sure many of our children (and us) have found the Sacrament time to be a little bit boring or we find our minds thinking of other things. This book is a great way to teach our children why we have the sacrament, what it represents, and what we should think about while we take it. It also has an explanation of the symbols of the sacrament which is another great teaching tool. I even learned some things from the symbols being explained! Did you know that the white cloth put on the sacrament table represents the cloth that covered Jesus' body in the tomb? I didn't! The book is written in poetry form which I love! I think that's a great way to get the attention of children. 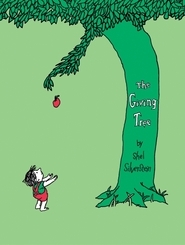 The story itself is also very clever - it's about a young boy who goes on a family vacation to his grandfather's house. Since they are there on Sunday, they go to church with him. They find the meeting very boring, but his grandfather teaches him about the sacrament in a way that he will always remember it. I love when childrens stories become teaching tools! It's a great way for children to learn! 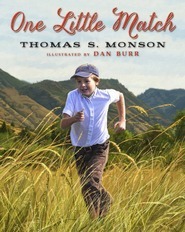 If you have younger children or grandchildren, then definitely check out this book! There are also great illustrations that portray the story so well! Excellent message for young and old alike! This is an excellent children's book! John Bytheway's story is such a great reminder about why members of the Church of Jesus Christ of Latter-day Saints take the sacrament on a weekly basis. I love the lesson the grandfather taught about focusing on what is important, and not getting distracted by everything else around us during this sacred time each week. I also really liked the section at the end that tells about the symbols of the sacrament. 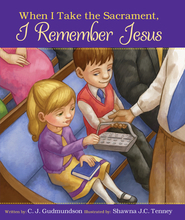 It is so important to understand why we do things, and this book is a great way to help teach/remind our children about what the sacrament is all about. I received a complimentary copy of this book, all thoughts and opinions are my own. I was very excited to review this book to review. A few days after I received it, there was a lovely Relief Society lesson given by a sister in my ward about the Sacrament. Sister Reader passed out papers to all the sisters that read, "What did you think of during the sacrament?" That sentence really made me think. Usually I read the scriptures during the sacrament, but did I truly think about the Savior and the importance of the sacrament? The next day at Family Home Evening, I was inspired to give a lesson about the sacrament. We read this lovely book together as a family and used the lovely experience of the author to better our understanding of the sacrament and the importance of partaking it every week. Also to encourage my family to be spiritually prepared to take the sacrament, and to be thinking of Jesus Christ, through prayer and the scriptures. My family and I will cherish this book and I am very grateful that it is in our home.